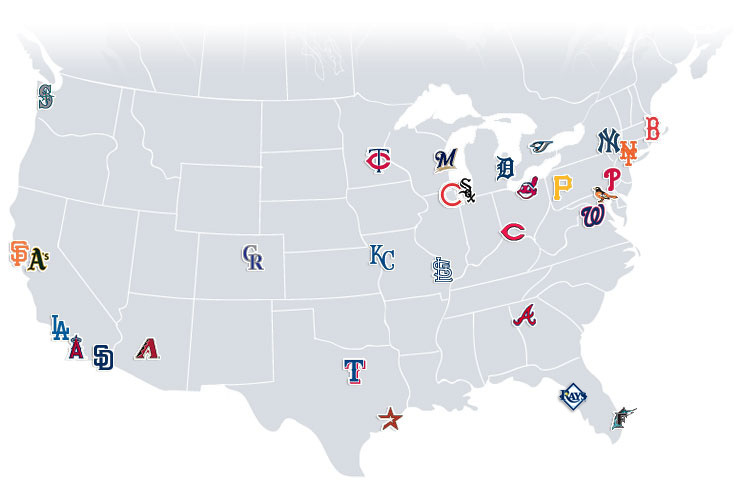 Yesterday, Major League Baseball officially announced the game times for the 2014 season. This might not affect your life that much -- the average person doesn't plan four months ahead down to the hour -- but I find that such announcements are a relief. They're proof that baseball will return, that the cold is abating, that the thaw is coming. Every baseball fan I know has a dream road trip. If it weren't for that blasted job, the doggoned mortgage, the inconvenient family getting in the way, we'd hop in the car and just go, man. Some years it's just a swing up the Eastern Seaboard to grab four or five parks or so; some years it's a jaunt west for all Southern California stadiums; some years it's a trudge through the upper Midwest. But we all want to do it. If real life didn't keep getting in the way, we all would. One trip in particular always entices me, right around this time of year. I've always wanted to spend the first month of the season, right when baseball is beginning, and hit all 30 stadiums in 30 days. Just a different one each day, knocking them all off, and then returning to the benign normalcy of daily life like nothing happened. I've wondered whether it could be done; I've wondered if I could get anyone to go with me; I've wondered (mostly) how much it would cost. So today, we're going to find out. I'm going to map out this crazy, theoretical, April road trip. The first caveat is that it's not, in fact, a road trip. To do this in 30 days, you're going to have to do some flying. I've allotted for that and accounted for road travel to be done by cabs, not by rental cars. If you want to drive on your own, in your own car, the whole way, you can do that, but honestly, I doubt you're going to make it out to the West Coast in time. Our country is very big. Also, to keep it as "inexpensive" as possible, I'll get the cheapest upper deck tickets possible. All that matters, as far as I'm concerned, is that I'm in the ballpark. Also, I've tried at every opportunity to find hotels within walking distance of the ballpark. I am taking this not-driving thing seriously. 2:20 p.m. GAME: Philadelphia Phillies at Texas Rangers, Upper Reserved 307. Cost: $22. 7:00 p.m. HOTEL: Crowne Plaza Suites Arlington. Cost: $151. Tuesday, April 1: Houston. In what's going to be a rarity on this trip, we can sleep in on the second day. It's a short jaunt south to knock out Texas, and we don't have to leave until the afternoon. Savor the sleep, we won't be getting much of it. 11:30 a.m. TAXI: Cab from Crowne Plaza Suites Arlington. Cost: $30. 2:15 p.m. TAXI: Cab from Houston airport to Minute Maid Stadium. Cost: $30. 6:10 p.m. GAME: New York Yankees at Houston Astros, Upper Reserved 432. Cost: $25. 10 p.m. HOTEL: Club Quarters Houston. Cost: $129. Wednesday, April 2: Arizona. I'd never heard of Spirit Airlines, but it's wonderful for our purposes, getting us from Houston to Phoenix one-way for $101. (Shame the Rockies aren't in town on April 2; that's only $35.) It's a night game, so you'll have to come up with something to keep yourself entertained in Phoenix all day. Maybe Scottsdale. 8 a.m. TAXI: Cab from Club Quarters Houston to Houston airport. $30. 10:20 a.m. FLIGHT: Spirit Airlines from Houston to Phoenix. $101. 1:28 p.m. PUBLIC TRANSPORTATION: Light rail from Sky Harbor airport to Chase Field. $2. 6:40 p.m. GAME: San Francisco Giants at Arizona Diamondbacks. Outfield Reserve 331, $30. 10:30 p.m. HOTEL: Hotel San Carlos, $142. Thursday, April 3: Oakland. Much to my chagrin, the A's and the Giants aren't at home at the same time, so we're going to have to take another trip to Northern California later. Unfortunately, the A's are the only team west of the Mississippi playing tonight that we haven't been to already, so they're the pick. 1:45 p.m. FLIGHT: US Airways from Phoenix to Oakland. $127. 3:30 p.m. PUBLIC TRANSPORTATION: BART from Oakland airport to O.com Coliseum. $3. 7:05 p.m. GAME: Seattle Mariners at Oakland Athletics, Plaza Outfield, $17. 11 p.m. HOTEL: Days Hotel Oakland Airport Coliseum, $68. Friday, April 4: Los Angeles. As it turns out, we're only going to be able to knock out a couple California teams while we're out here. The Dodgers and the A's are the only ones in town this weekend. Dodger Stadium will be gorgeous though, even this early. 7:30 a.m. PUBLIC TRANSPORTATION: BART from hotel to airport. $3. 9 a.m. FLIGHT: Delta from Oakland to Los Angeles. $84. 10:25 a.m. TAXI: Cab from LAX to Dodger Stadium: $46. 1:10 p.m. GAME: San Francisco Giants at Los Angeles Dodgers, Top Deck 8, $15. 5 p.m. TAXI: Cab from Dodger Stadium to LAX: $46. Saturday, April 5: Denver. No matter what time we leave, we'll have some time to kill in Denver. Depending on your inclination, and Colorado's recent changes in jurisprudence, this could lead one to all sorts of recreational activities. 11:16 a.m. FLIGHT: United from Los Angeles to Denver. $146. 2:34 p.m. TAXI: Cab from Denver airport to Coors Field: $50. 6:10 p.m. GAME: Arizona Diamondbacks at Colorado Rockies, Rockpile, $6. Sunday, April 6: Kansas City. Anytime you're flying into a small airport like Kansas City's, you're flirting with danger. I've had three flights into Kansas City in my life, and two of them have been flat-out canceled. Let's roll the dice with United this time. 6 a.m. TAXI: Cab from Coors Field to Denver airport: $50. 7:59 a.m. FLIGHT: United from Denver to Kansas City. $106. 10:36 a.m. TAXI: Cab from Kansas City airport to Kauffman Stadium. $24. 1:10 p.m. GAME: Chicago White Sox at Kansas City Royals, Outfield Box, $22. Monday, April 7: St. Louis. You know what would be lovely? A train! There's something about a train that's magic. What better way to see the glory of Missouri than by Amtrak. It's the Missouri River Runner, and it'll change your life. 8:15 a.m. TRAIN: Amtrak from Kansas City to St. Louis. $29. 1:55 p.m. PUBLIC TRANSPORTATION: Light rail to Busch Stadium. $2. Tuesday, April 8: San Francisco. Time to start knocking out some more of those West spots. St. Louis is the gateway, after all. 5:30 a.m. TAXI: Cab from Busch Stadium to St. Louis airport. $25. 7 a.m. FLIGHT: Frontier Airlines from St. Louis to San Francisco (via Denver). $161. 10:48 a.m. TAXI: Cab from San Francisco airport to AT&T Park. $40. 1:35 p.m. GAME: Arizona Diamondbacks at San Francisco Giants, Reserve Left Field 332, $40. 5 p.m. HOTEL: The Mosser, $101. Wednesday, April 9: Seattle. I assume at this point the city will have finally stopped celebrating their Super Bowl victory. By the way, this is our first Virgin America flight of this trip. Highly recommended: You can play DOOM on the back of the seat of the person in front of you. They love that. 10 a.m. TAXI: Cab from AT&T Park to San Francisco airport. $40. 11:55 a.m. FLIGHT: Virgin America from San Francisco to Seattle. $69. 1:55 p.m. TAXI: Cab from Seattle airport to Safeco Field. $30. 7:10 p.m. GAME: Los Angeles Angels of Anaheim at Seattle Mariners, Left Field View 342, $25. Thursday, April 10: Minnesota. Red-eye! It's impressive it has taken us this long to hit a red-eye flight. The next couple of days are going to be exhausting, so hang in with us. Because there are again no Western games today, we're going to zip over to the Twin Cities real fast for an afternoon game, then zip right back out. If you've made it this far, you know you don't need to sleep or shower. The cold of Target Field will wake you up anyway. 11 p.m. TAXI: Cab from Safeco Field to Seattle airport $30. 12:50 a.m. FLIGHT: Delta from Seattle to Minneapolis, $169. 6 a.m. TAXI: Cab from Minneapolis airport to Target Field. $34. 1:10 p.m. GAME: Oakland A's at Minnesota Twins, 212 Home Plate Terrace, $40. 10:15 p.m. TAXI: Cab from San Diego airport to Petco Park. $20. Friday, April 11: San Diego. Yes, that's right: You just went from a game to an airport to a game to another airport without ever stopping at a hotel to sleep. You're a gamer. Here's your chance to get some sleep, though. You powered through what was essentially a 36-hour day in three different time zones, and once you check into the hotel by Petco Park, you can pass out until first pitch. You've earned it. Midnight. HOTEL: Hotel Indigo Gaslamp, $143. 7:10 p.m. GAME: Detroit Tigers at San Diego Padres, Bleachers, $20. 11 p.m.: HOTEL: Hotel Indigo Gaslamp, $143. Saturday, April 12: Anaheim. Now would you look at this: We're less than two weeks in, and we've knocked out everything west of Milwaukee. I deserve a medal. You deserve a leisure train ride through Southern California. Noon. TRAIN: Amtrak from San Diego to Anaheim. $35. 6:05 p.m. GAME: New York Mets at Los Angeles Angels of Anaheim, Right Field MVP 238, $30. 10 p.m. TAXI: Anaheim Stadium to LAX, $75. Sunday, April 13: Chicago. This is the last red-eye. Say goodbye to the Pacific time zone: It's all Eastern and Central from here on out. We've got three options here, all in the Midwest: Milwaukee, Chicago (White Sox) or Cincinnati. I went with Chicago, because it's easier to fly there from LAX than the other two cities. No matter what, this is going to be another rough stretch. 12:30 a.m. FLIGHT: United from Los Angeles to Chicago (via Houston). $229. 10:55 a.m. TAXI: Cab from O'Hare Airport to U.S. Cellular Field. $46. 1:10 p.m. GAME: Cleveland Indians at Chicago White Sox, Upper Tier 526, $25. Monday, April 14, Milwaukee. Hasn't this trip given you a greater appreciation for trains? Wait until we get to the East Coast. Also: This is the day you make up all that rest you lost on the red eye from Los Angeles. 3:15 p.m. TRAIN: Chicago to Milwaukee, $50. 4:44 p.m. TAXI: Cab from Milwaukee train station to Miller Park, $20. 7:10 p.m. GAME: St. Louis Cardinals at Milwaukee Brewers, Upper Deck 413, $30. 10:30 p.m. HOTEL: Best Western Woods View, $126. Tuesday, April 15, Detroit. It's tax day. It probably would have been wise to do this before the trip started. Though if you're doing this, I don't know how you have a job with earnings to be taxed. 7 a.m. TAXI: Cab from Miller Park to Milwaukee airport. $34. 9:20 a.m. FLIGHT: US Airways from Milwaukee to Detroit (via Philadelphia, oddly), $151. 4:06 p.m. TAXI: Cab from Detroit airport to Comerica Park, $40. 7:08 p.m. GAME: Cleveland Indians at Detroit Tigers, Upper Deck Lounge 331, $40. 11 p.m. HOTEL: Holiday Inn Express and Suites, $144. Wednesday, April 16, Cincinnati. Of all the flights I've put together for this, none are more expensive that travelling from Detroit to Cincinnati. Obviously. That's surely what you would have guessed. 6 a.m. TAXI: Cab from Comerica Park to Detroit airport, $40. 7:35 a.m. FLIGHT: Delta from Detroit to Cincinnati, $435. 8:47 a.m. TAXI: Cab from Cincinnati airport to Great American Ballpark, $34. 12:35 p.m. GAME: Pittsburgh Pirates at Cincinnati Reds, Section 522, $25. 4 p.m.: HOTEL: Millennium Hotel Cincinnati, $161. Thursday, April 17, Pittsburgh. At last, after all your travels, you arrive at what might be the prettiest stadium in the majors. It's gonna be freezing, though. 7:47 a.m. TAXI: Cab from Great American Ballpark to Cincinnati airport, $34. 9:16 a.m. FLIGHT: US Airways from Cincinnati to Pittsburgh (via Charlotte), $253. 1:07 p.m. TAXI: Cab from Pittsburgh airport to PNC Park, $40. 7:05 p.m. GAME: Milwaukee Brewers at Pittsburgh Pirates, Right Field 303, $30. 11 p.m. HOTEL: Wyndham Grand Pittsburgh, $161. Friday, April 18, Chicago. After three weeks on the road, nothing will make you feel more completely refreshed, as if you have just started your trip, than some afternoon baseball at Wrigley. This is a good time to check out the changes they've made to the park and if it feels any different. Warning, though: Your travel weariness might have you hallucinating Clark the mascot. 7:30 a.m. TAXI: Cab from PNC Park to Pittsburgh airport, $40. 10:20 a.m. TAXI: Cab from O'Hare to Wrigley Field, $35. 2:20 p.m. GAME: Cincinnati Reds at Chicago Cubs, Upper Deck, $50. 6 p.m. HOTEL: City Suites Hotel, $161. Saturday, April 19, Tampa. It's time to knock out those two sore thumbs in Florida. You can wipe them out in a weekend and then forget you were ever there. 6 a.m. TAXI: Cab from Wrigley Field to O'Hare, $35. 8 a.m. FLIGHT: Spirit Airlines from Chicago to Tampa, $98. 11:38 a.m. TAXI: Cab from Tampa airport to Tropicana Field, $35. 7:10 p.m. GAME: New York Yankees at Tampa Bay Rays, Right Field Deck, $30. 10:30 p.m. HOTEL: The Pier Hotel, $139. Sunday, April 20, Miami. If you get a chance while you're here, could you steal that sculpture? It's sort of amazing this hasn't been done yet. 7 a.m. TAXI: Cab from Tropicana Field to Tampa airport, $35. 9:15 a.m. FLIGHT: American Airlines from Tampa to Miami, $128. 10:15 a.m. TAXI: Cab from Miami airport to Marlins Stadium, $15. 1:10 p.m. GAME: Seattle Mariners at Florida Marlins, Right Field, next to sculpture, $22. 5 p.m. TAXI: Cab from Marlins Stadium to Miami airport to Marlins Stadium, $15. 10:45 p.m. TAXI: Cab from Cleveland airport to Progressive Field, $38. Monday, April 21, Cleveland. There aren't many people in the world that would sprint out of Miami to get to Cleveland, but I am one of those people. Florida is just terrifying, in general. Now you get to spend the whole day chilling in Cleveland. May I recommend the Rock and Roll Museum? Or also maybe the Rock and Roll Museum? 7:05 p.m. GAME: Kansas City Royals at Cleveland Indians, Bleachers, $20. Tuesday, April 22, Toronto. Please, please tell me you didn't forget your passport. 8:45 a.m. TAXI: Cab from Progressive Field to Cleveland airport, $38. 7:05 p.m. GAME: Baltimore Orioles at Toronto Blue Jays, Upper Level 520, $20. Wednesday, April 23, Boston. A trip like this wouldn't be worth it if you didn't pop into a Yankees-Red Sox game at Fenway, would it? 4:35 p.m. TAXI: Cab from Logan airport to Fenway Park, $30. 7:05 p.m. GAME: New York Yankees at Boston Red Sox, anywhere, $150, probably. Thursday, April 24, New York. Relax, the intensely overpacked populations on the East Coast are going to give you a few days off from planes. This is a wonderful chance to get caught up on whatever has been going on in the world for the last three weeks. Wait, are we at war? 6 a.m.: TAXI: Cab from Fenway Park to Boston South Station, $55. 7:15 a.m. TRAIN: Amtrak from Boston to New York Penn Station, $73. 1:10 p.m. GAME: St. Louis Cardinals at New York Mets, Pepsi Porch, $40. 5 p.m. SUBWAY: Get back to Times Square. And walk fast and don't look up when you get there. $2.50. 7 p.m.: HOTEL: The Warwick, $210. Friday, April 25, New York. The good news for you here is that the Yankees won't be eliminated from the playoffs yet. 5 p.m. SUBWAY: Just get to Grand Central and take the 4. This isn't so hard. $2.50. 7:05 p.m. GAME: Anaheim Angels at New York Yankees, Upper Deck, $40. 11 p.m.: HOTEL: The Warwick, $210. Saturday, April 26, Washington. You are so close now. Can you believe you are this close? Do you even remember what life is like? What it was once like to live, to breathe, to bathe? 8:05 a.m. TRAIN: Amtrak from Penn Station to Washington DC Union Station, $59. 11:30 a.m. TAXI: Cab from Union Station to Nationals Park, $12. 1:05 p.m. GAME: San Diego Padres at Washington Nationals, Right Field Box, $35. 7:20 p.m. TRAIN: Amtrak from Washington DC Union Station to Baltimore Penn Station, $12. Sunday, April 27, Baltimore. I went ahead and put you in Baltimore a day early. At this point, we're not worried about tourist attractions: We're just trying to get this done, so now you have two nights in Baltimore. Don't pretend you aren't thrilled. 1:35 p.m. GAME: Kansas City Royals at Baltimore Orioles, Left Field Tier, $30. Monday, April 28, DAY OFF. You're never going to believe this, but … you have a day off. Sorry. Neither Philadelphia nor Atlanta, the two teams left, play today. Use this opportunity to further explore Baltimore. Tuesday, April 29, Philadelphia. You have come to the last step of your journey. (Because we started in Atlanta, I assume you live somewhere near and can just wait until they're back in town on May 2.) It ends, like all things must, in Philadelphia. 5:15 p.m. TAXI: Cab from 30th Street Station to Citizens Bank Park, $16. 7:05 p.m. GAME: New York Mets at Philadelphia Phillies, Right Field Deck, $30. 10:30 p.m. HOTEL: Holiday Inn Philadelphia, $163. Wednesday, April 30, flying home. You made it. Everyone you ever cared about in your life has deserted you, you are bankrupt, and you've gained about 50 pounds … but damn it, it was still worth it, wasn't it? 3:30 p.m. FLIGHT: Delta from Philadelphia to Atlanta, $131. For the trip of a lifetime, that seems like a pretty good deal to me.